Kansas is known for its intensely hot summers. But this year, debate is nearly as heated and intense among the many health providers and consumers who are increasing their call on the Administration and legislators to address an array of health care access problems. A number of public forums have been hosted over the past several weeks organized by the Alliance for a Healthy Kansas, the Kansas Department of Health and Environment and the Kansas Department for Aging and Disability Services, and the Centers for Medicare and Medicaid Services (CMS). Health and mental health program directors, hospital leaders, nursing home administrators and consumers have repeatedly expressed strong and ongoing concerns about KanCare’s operations, the state’s eligibility system backlogs, and proposed reductions in KanCare reimbursement rates. For many of the health organizations that serve uninsured and medically vulnerable people, this might be characterized as their summer of discontent. The testimonies and stories shared at public meetings and reported in newspapers and on TV stations across the state have revealed deficiencies in our state’s Medicaid system and how these problems are straining the health care safety net that serves people who don’t have ready access to affordable health care. They are as heartbreaking as they are puzzling. It wasn’t always this way in Kansas. Once known for its strong commitment to care for those less fortunate, Kansas is quickly becoming the state of broken systems and broken promises. For example, cuts in federal Medicare payments to Osawatomie State Hospital, one of two state-run inpatient psychiatric treatment facilities, were announced in December because of serious, unresolved issues affecting treatment as well as patient and worker safety. Application processing backlogs tied to the state’s Medicaid eligibility system left thousands of people waiting for action on their applications last year and into the current year. Nursing home operators have been asking the state for financial relief as they have struggled to carry uncompensated care costs for residents waiting on processing of Medicaid applications. The financial strain has been too much for some operators, forcing some families of Medicaid-pending residents to shop for other options due to lengthy delays. More recently, the Kansas Hospital Association and physicians and administrators from several of its member hospitals have voiced strong concerns about a 4 percent cut in the Medicaid provider reimbursement rate approved by the Governor in May to help address state budget shortfalls. The Governor approved cuts of more than $56 million from the state’s Medicaid program, with approximately $38.2 million tied to reducing reimbursements for providers treating patients covered by KanCare. The proposed 4 percent reduction requires the approval of CMS. The Kansas Hospital Association has formally communicated its concerns in letters sent to KDHE in June and July. A little more than a week ago, one of the REACH Foundation’s core partner grantees, Wyandot Inc., announced it was eliminating a number of full-time and part-time positions and leaving 18 job vacancies unfilled, affecting services for approximately 800 adults and children. Wyandot Inc. provides counseling, psychiatric treatment, crisis intervention and housing support for more than 7,500 adults and children, primarily in Wyandotte County. The community mental health center cited reductions in state funding for mental health services and the anticipated cuts in the KanCare reimbursement rate as the impetus for reducing services. Following last week’s announcement, Randy Callstrom, president and CEO of the agency, wrote an op-ed published in the Kansas City Star, expressing his worries about the continuous fraying of the mental health safety net system. These troubling developments, which highlight large cracks in our increasingly strained health systems, remind us of the purpose and importance of a health care safety net where everyone is doing their part, including the state, to maintain systems of care for people in need. Medicaid, a critical component of the safety net, is funded under a cost-sharing agreement between the state and the federal government – with the federal government supporting the larger share. After 2012, when the U.S. Supreme Court ruled that state’s expansion of Medicaid under the Affordable Care Act is optional, many states chose to do so in order to close their coverage gaps for low-income citizens in need of health insurance. Through a variety of state-created plans, more low-income citizens gained access to coverage that has since enabled them to seek preventative care and better manage their chronic conditions. Sadly, Kansas is one of 19 states (including neighboring Missouri) that have continued to opt out of this opportunity despite growing evidence that such an expansion would increase jobs, grow the economy and reduce the uncompensated care burden on our hospitals. More than 150,000 hard-working Kansans find themselves in the gap instead. While the state’s revenues continue to plummet, the Legislature has refused to access $1.9 million a day in our federal tax dollars that could be used to shore up the safety net and free up state general funds that could be used to support other priorities important to Kansans, such as education and transportation. Last year, when the REACH Board of Directors and staff revisited our funding priorities and targets to develop the foundation’s next five-year strategic plan, we recommitted ourselves to continue to invest in a strong health care safety net along with investments aimed at expanding access to health care and reducing the coverage gap. 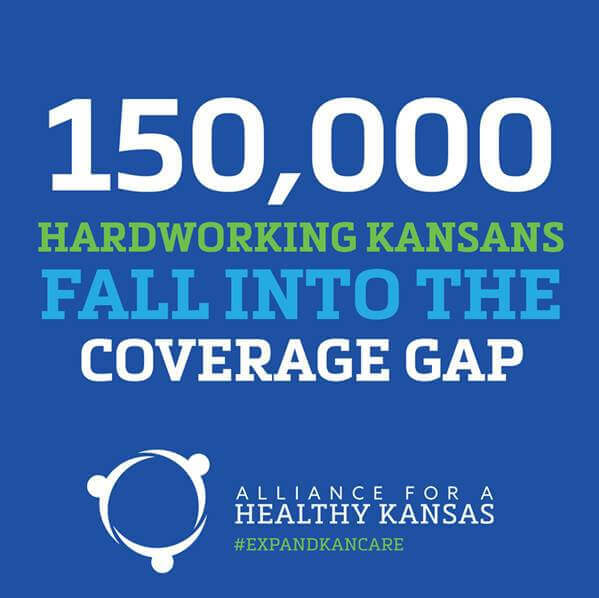 As all of us follow political conversations about health care in the coming months, it’s important to keep in mind the missed policy opportunity to advance the health of Kansans and repair the fraying safety net by expanding KanCare, Kansas’ Medicaid program. It’s what Kansans instinctively do when faced with a challenge or learn of a neighbor in need: We take stock of the situation, identify a solution and make it happen.